As we speak, I’m sitting in the San Francisco International Airport, half-asleep on my luggage with Starbucks in one hand and my boarding pass in the other. London, here we come! So you can share in my excitement, I’ve devised this guide to 26 of London’s most important, most unusual and most memorable locations, plus a literary love of phonetics and a little dash of dry pop culture humor. Some of these locations are places in London I have visited myself, others are places I plan to visit in the next few days on my return trip to the city, and still others are simply unique examples of the diverse array of activities and sights in the city. 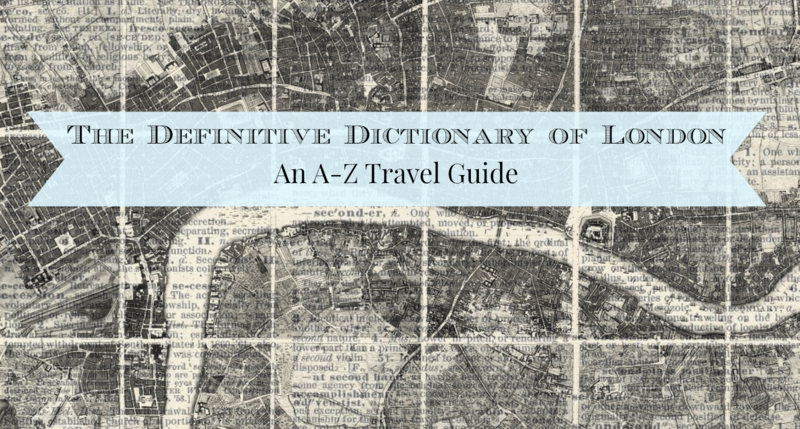 This ‘dictionary’ hits some of the big tourist spots but also makes an effort to encompass more unique, but still quintessential, London experiences. While we’re on the subject of London, I’ll be there for several days before moving on to various other British, Welsh and Scottish cities over the next two weeks. To say I’m excited is an understatement, despite having left the house this morning at 2:50 am. Yes, 2:50 am. But don’t worry: Strawberry Moon has plenty in store while I’m away, as I’ve scheduled numerous travel-related posts for the duration of my trip. If you’re interested, you can follow along with my adventures at my travel blog, The Wayfarologists. Have a lovely rest of June, readers! : an 18 ft statue of the Greek hero, Achilles, in honor of Arthur Wellesley, the first Duke of Wellington, located at the southeast corner of Hyde Park only a 15 minute walk from Buckingham Palace. : an underground bunker-turned-museum used by Winston Churchill and his staff and officers during the Blitz of World War II. : a former church badly damaged during the Blitz and later converted into a hauntingly beautiful public park space. 1 : a series of marble sculptures removed from the Parthenon in Athens by Thomas Bruce, the 7th Earl of Elgin, and purchased for the British Museum in 1816. 2 : a highly controversial subject in the art world for two hundred years. : a beautifully planted flower garden and paths through the southwest portion of Hyde Park, near Kensington Palace. : London’s Chinatown, complete with elaborate Chinese arches at each end of the pedestrian only street. 1 : the home of government in the United Kingdom, but open for tours. 2 : that huge building in the background of all your Instagrams of the Big Ben clock tower. 1 : a North London borough known for alternative theater. 2 : Neil Gaiman’s Angel. : a beautiful lush park in downtown London with a lake and, occasionally, a prime view of the Guard as they march down the Mall. 1 : a resplendent library housing books on art history, religion, archaeology, trade, ancient scripts and natural history as well as an array of relevant sculpture. 2 : also known as the Enlightenment Gallery in the British Museum. : the northernmost end of the Serpentine lake in Hyde Park, the Long Water is a peaceful respite from the hustle of London traffic and backs up to the Italian Gardens. : a family-friendly history museum located on and near segments of the old London Wall, featuring Roman, medieval and modern galleries dedicated to the city’s colorful past and present. 1 : a quirky district of London just north of Kensington Gardens that includes the famous Portobello Road Market. 2 : an adorable Hugh Grant movie. : a daily market of antiques, food and gifts in the 19th century Horner Buildings. : a bustling center of shops and theaters, not far from Chinatown. : an early 20th century West End theatre known for its beautiful interior décor and ten-year run hosting Les Miserables which transferred from the Palace Theatre in 2004 after 18 years. : a 21st century London curiosity that spans the Paddington basin and curls up into a freestanding octagon when it needs to be moved out of the way. : a Yinka Shonibare original, this whimsical sculpture is a 1:30 replica of Nelson’s flagship, HMS Victory, which resides on the fourth plinth of Trafalgar Square, just outside the renowned National Gallery which celebrates the best of European art. : a must-see experience of medieval London architecture, history and culture, with wonderful connections to the past and present (including views of Roman ruins and the Gherkin building), despite being the mother of all tourist traps. 1 : a labyrinthine subway system with 270 stations, (the oldest of which is Paddington from 1863), and 250 miles of track, making it the easiest but often most crowded way of getting around London. : the picturesque convergence of canals in northern London that meet at several waterside pubs and riverboat services. : an East London district best known for the unsolved Jack the Ripper murders in the 1890s and subsequent dime-a-dozen ghost tours in the 2000s. : a former 19th century power station converted into shops and restaurants with views of East London. : a 17th century stone gate to the Thames built for use by the Strand mansions, that is now located 150 yards from the river, thanks to the Thames Embankment. : summer Friday night after-hours access to the London Zoo.